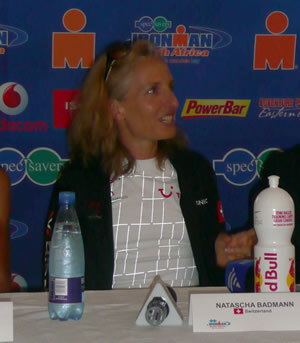 Legend, that is what Natascha Badmann is. Chrissie Wellington may well be carving out her own piece of triathlon history with every race and record she sets, but she'll have to win at least another three Kona titles to catch up with the six Ironman World Championships on the CV of Switzerland's Badmann. 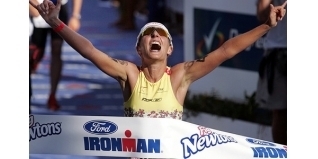 In 2007, Natascha collided with a cone at high speed on the Kona lava fields during the Ironman World Championship, suffering injures - at age 40 - that had doctors telling her that here triathlon career was over. "I was lying on the floor, my bike was on top of me and I couldn't get up... try lying down and get up without using your arms, it simply wasn't possible." Four years after racing here in Port Elizabeth - she won the race on three consecutive occasions 2005/6/7 - Natascha is back at 44, and couldn't be happier. Small in stature but huge in personality and warmth, it was an honour to spend a few minutes with The Swiss Miss. JL: You talked in the Press Conference today about the major difficulties you've had in returning from your major crash (Kona, 2007), so just how excited are you to be back and racing at all? NB: Oh, I'm all excited! When I think about it, and to talk with you I get goose bumps right away because it's just something that was so far away. You know, to go down in life is easy, you don't need any effort, you go down all by yourself and you increase in velocity... but if you want to go up (return from illness / injury), it's damn hard and you have to 'pedal' all the time! So, it was a long time struggling uphill and now I'm more than glad. It's just beyond words to be here. JL: And how fit do you feel? Certainly a couple of years ago we saw you racing in some 70.3 and middle distance races and were cycling phenomenally fast - you won in New Orelans, and had some other good performances - so, what are your hopes for Sunday? NB: These are short distances, so the fact with my shoulder was that I couldn't hold my aero position for more than two hours, so I had to work so hard because I had no outside rotation, so I had to work to get three hours, fours hours in condition to be able to have that aero position - and then still be able to run, because afterwards I needed my shoulders to run. So, I'm really not knowing what is coming up, I mean I feel strong and I feel healthy which is the main thing but I haven't been racing such long distances because I was not ready, and you need to be 100% ready and your body needs to work out perfect otherwise you cannot race in an Ironman. JL: Are you still going to be racing the famous Cat Cheetah bike? NB: Yes, I'm still going to be racing my Cheetah - I feel it belongs here in South Africa! JL: You have won so many Kona titles, and then Chrissie Wellington has come along after you and has started on the same vein with three already; how much respect and how much enjoyment have you got as another athlete watching what Chrissie has been able to do in Ironman racing? NB: What she is doing, its just wonderful. I met her personally today for the first time, I haven't even talked to her before, it's just something...it's something from another world - I never dreamed to do the times that she does. It's completely outstanding! JL: What are you plans for the rest of the year after this race - will you do more Ironman races later this year if you come through this one fit and healthy? NB: I think so. I think once I chose Ironman as my lifestyle it will always be part of my life if its possible and I'm physically healthy. But honestly, I have not planned what other races I will do from now on because I don't know how long I will need to recover and as I said, it's a new experience - even if in my mind I'm still the race horse I was. Or like I say, I was a Ferrari, but now I'm a Lambourghini - but I don't know how everything works out so I need to probably make some adjustments or whatever to get in proper race shape! JL: Well good luck with it, it really is fantastic to see you back racing again and I hope you have a fantastic day on Sunday. NB: Wonderful, thank you so much.